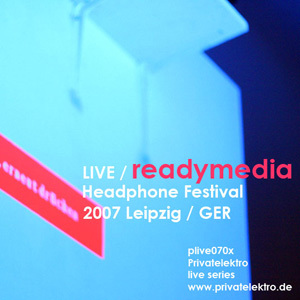 This live set was originally recorded/broadcast on 10.08.2007 at Kuhturm gallery, Leipzig, during Privatelektro’s 4th Headphones Festival. Two ten-minutes-compositions founded on a monotone minimal rhythm. Poured in melodies swing between relaxing and melancholic moods. The texture of melody and rhythm dives into the but and ben moving breakers of plane sound. This recording offers to the openminded soundsurfer a meditative experience and a crispy nostalgic sound design. refreaph von readymedia ist lizenziert unter einer Creative Commons Namensnennung – Nicht kommerziell – Keine Bearbeitungen 4.0 International Lizenz.